Home > Generosity, Lifters	> Cupcakes, Beards, and Beard Cupcakes! 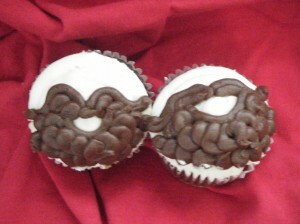 Cupcakes, Beards, and Beard Cupcakes! If you like cupcakes, beards, kids, or any combination of the three, order a box today from Baking for the Taking and tell ’em The Beard sent you! Schedule a pickup right from the bakery at 5740 N. Milwaukee here in Chicago or have them DELIVERED TO YOUR DOOR anywhere in Chicago for just $5! It’s the yummiest way possible to help the kids of Chicago! UPDATE: Marisa says you can even customize your cakes! Here’s the full menu; I can personally vouch for the red velvet! Any questions? Call Baking for the Taking direct: (773) 951-5025. Everybody should get them sum. I think I’ll put it to the test. Okay, poetry is not my strong suit. Maybe a cupcake will help? Now THAT’S a Happy Beard! Lift 4: A Gary Fisher Mountain Bike!